Whether you’re gazing at the stars or focusing in on the gorgeous hues of a bird’s feathers, a pair of binoculars that are equipped to get the job done is essential. I know it’s been my pastime with my family for the past decade. We use them every time we go camping. Binoculars have come a long way from being the barely clear set of miniature telescopes when they were first invented. Now, they help you see more than the big blurry picture, such as minute-details of a deer’s fur or snow falling from the mountaintop. Since their evolution, companies have been designing binoculars to not only appease to the general public, but also for people who have specific uses for them. And the image quality that they produce is incredible. 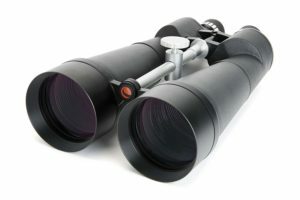 Let’s look at the best binoculars for a range of different activities that you can purchase today. Nikon is one of the most popular brands in the world when it comes to purchasing cameras, so it’s no surprise that one of their models is our overall top pick for best binoculars. The Nikon 7548 Monarch 7 is a versatile pair of binoculars that you can use for bird watching, hunting, sports, and hiking. The Nikon Monarch 7 has an 8x magnification and a 42mm objective lens diameter. It’s the perfect combination to balance viewing your target with your hands shaking. Field of view is calculated at 1,000 yards and measured in feet. The FOV of this model is 420 feet. So when you are 1,000 yards away from an object, it allows you to see 420 feet of the surrounding area. Using these to watch a flock of birds or sporting event isn’t a burden. With a wide field of view, you move your head far less often. The close focus is 8.2 feet. The eye relief is 17.1 mm. Anyone who wears glasses knows how important it is to have an eye relief long enough to where they can easily use their binoculars to its full potential without having to remove their glasses. Even if you’re only near or farsighted, being able to experience a moment while it’s happening without having to perform a switch can potentially make or break a pair of binoculars. The Nikon Monarch 7 is built with premium ED (Extra-low Dispersion) glass to accommodate its roof prism design. This glass type significantly reduces the risk of chromatic aberration that occurs when light passes through lenses. While other lenses, such as the achromatic, work to make red and blue colors at the ends of the wavelength confine to one focal point, it doesn’t reduce the chromatic aberration that occurs with greens and yellows. This distortion in color, known as the secondary spectrum, can also lead to not-so-clear images. That’s what makes ED glass so desirable. It gives you an image that’s sharp and clear. The lenses are also eco-friendly, free of any lead or arsenic found in a standard binocular glass. The Nikon features turn-and-slide rubber eyecups, smooth central focus knob, right-eye diopter, and flip down lens caps. Its eyecups allow you to adjust the amount of eye relief you need to see the entire object you’re looking at. The rubber also offers comfort during extended use. When bracing any type of weather, these waterproof and fog proof binoculars is your best bet. Even if you don’t plan on sitting in the rain, you can benefit from the O-ring sealant that’s so powerful it prevents any dust and small debris from getting inside. If you ever owned a pair of binoculars before, you know how frustrating it is to look through them only to start rubbing at your lens, hoping to remove that irritating speck of dust that’s disrupting your view. In areas with rapid changes in temperature, it’s imperative that you own a pair of for proof binoculars. These binoculars had the oxygen inside if them removed and replaced with nitrogen gas. In case you’re wondering, the outside lenses aren’t fog proof and can still be affected by the humidity. To clean them, gently wide them with a microfiber cloth. Besides being resistant to water, debris, and fog, it’s rubber armored body provides strengthened durability. You’ll never have to worry about your binoculars slipping out your hands because these have a non-slip grip. The Nikon Monarch 7 weighs 1.3 lbs and its dimension is 5.7 x 5.1 x 1.65 in. It’s lightweight and slim design makes it comfortable to use for extended periods of time. The Nikon Monarch 7 has advanced multi-coated lenses. These lenses allow you to see up to 95% of the light that is being transmitted. That means that 95% of the light that is coming through the lenses are reaching your eyes. The image has a high contrast and clear resolution. Better optical quality also helps distinguish between fine details and retain clarity. So to sum that up, the coating on these binoculars lets you perceive almost the same amount of brightness as the naked eye. Stiff right-eye diopter. When trying to adjust the right-eye diopter, it’s stiff. Although adjusting it isn’t smooth as the focus knob, once in place, you don’t have to worry about it drifting. Loose eye-side lens cap. When trying to recap the binoculars, the lens cap doesn’t fit snuggly. If you’re walking fast or running, it’s very likely that the cap will come off. While this can be a problem, the cap’s design lets you access your binoculars in a split-second. So, if you’re trying to quickly capture a moment, you don’t have to struggle with uncapping your lenses. The Althon Optics Midas is known for its unbelievable brightness when looking at the sky and even in low light. That’s why their the best binoculars for birdwatching. Even against the sun’s radiance or the darkness of dense trees, they still produce clear, crisp images. The Athlon Optics has an 8x magnification and a 42 mm diameter. Its field of view is 426 feet which make following a bird’s movements easy as it doesn’t require you to move very often. Its close focus is 6.5 feet. While FOV is important for viewing birds that are far away, a good close focus makes viewing birds and insects that are close up a pleasure that can’t be beaten. The eye relief is 17.2 mm, letting people with glasses to see the entire field of view. The Athlon Optics has an ED glass, similar to the Nikon Monarch 7, resulting in clearer, sharper images for the eye to see without chromatic aberration. It has a roof-prism that draws light straight from the objective lens to the eyepiece. The prism is also phase corrected, so it produces images with a higher resolution, contrast, and color reproduction. This correction lets you see every detail of a bird’s wings. In addition to the phase correction, prisms are also BaK-4 so it reflects more light to your eyes, letting you see sharper, brighter images. All of these components combine to give you an image that’s comparable to the naked eye. The twist-up eyecups let you set your eye relief with intermediate stops so you can view your image without any eye strains. They’re also waterproof and fog proof, providing high-quality protection against rapid temperature changes and harsh weather conditions. Purged with Argon molecules, these binoculars are less likely to leak gas from between the O-ring seals when they’re dropped. The Athlon Optics weighs 2.2 pounds. Its dimensions are 5.2 x 3.3 x 5.7 inches. The Athlon Optics has advanced fully multi-coated lenses which provide high levels of light transmissions that bring maximum brightness and true color across the entire length of the light spectrum. Because they’re coated with ESP (Enhanced Spectral Prism) dielectric coating, they reflect 99% of light to your eyes. You can see the amazing contrast and color fidelity of the different shades of a bird’s feathers. To ensure that the outside of the binoculars is just as protected as the inside, the outer lenses are coated with an XPL (extra protection layer), to prevent dust, dirt, oil, and scratches from ruining a perfectly good pair of binoculars. It’s not very light. It’s not too heavy either, but using it for extended periods can cause your arms to ache. It comes with a neck strap that you can use to alleviate the slight discomfort associated with it. Press-in lens. Like the Nikon Monarch 7, the lens caps don’t fit snugly over them. The design doesn’t provide for much protection, but it still lets you access your binoculars with ease. Vortex is known for their scopes and binoculars whose operations are comparable to world-class brands but at a fraction of the cost. Each of their products are designed to meet high-quality standards that are loved by hunters all over the US. 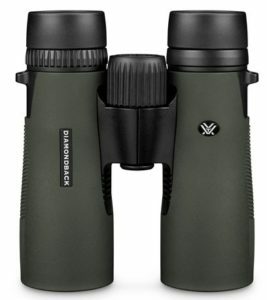 Their Vortex Optics Diamondback 10x42 are the best binoculars on the market for hunting and won’t disappoint. The Vortex Diamondback has a 10x magnification and 42mm objective lens diameter. Unlike the previous two, these binoculars magnify images 10 times more than what the naked eye can see. 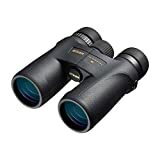 When hunting, whether, in broad daylight or low light, you need that extra magnification to see and pinpoint an animal that’s further in the distance that an 8x binocular wouldn’t catch as easily. Its field of view is 330 feet. Although it doesn’t have a high FOV, quality and clarity of images aren’t compromised because of it. And depending on what type of game you’re hunting, you won’t need an extremely high FOV to track its movements. The close focus is 6.7 feet, letting you focus in on animals that are within 3 meters comfortably. The eye relief is 15 mm. The Vortex Diamondback has a roof prism design with phase corrections that help show your images as clear as possible. Also, it comes with multi-position twist-up eyecups. Because our visions are unique to each of us, we see life differently, with and without binoculars. To help counter the focal differences in your eyes, it comes with a right eye diopter. Besides focusing each lens individually, the center focus wheel allows you to focus both lenses at once. To protect against external conditions that can damage these binoculars, they have a non-slip rugged armor exterior. These binoculars are incredible in harsh conditions because they are water and fog proof. Even if you’re not someone who hunts in any type of rain, moisture is everywhere. Humidity, even if it’s not thick in the air can fog up a pair of binoculars. Nothing’s more frustrating than waiting for the inside of your binoculars to dry up so you can use them properly. Even worse, you can miss your target while waiting. To avoid going home annoyed and displeased, the Vortex Diamondback is purged with Argon-gas and sealed with O-rings. The Vortex Diamondback weighs 1.34 lbs. Its dimensions are 5.8 x 0.1 x 5.1 inches. Since it’s so lightweight, you can use and carry them without having to exhaust your arm. The Vortex Diamondback has fully multi-dielectric coated lens. Because of how roof prisms are designed, one prism doesn’t have any internal reflection. So, to ensure that the maximum amount of reflectivity is occurring, the prisms inside these binoculars underwent dielectric coating. This type of coating also lets you perceive as much brightness as you would with your naked eye. Since it’s fully coated with multiple levels of anti-reflective, they provide an increased amount of light transmissions on all air-to-glass surfaces. Not-as-clear edges. The edges of an image appear slightly blurry. Depending on what you’re used to, this might not be a problem at all. While you can’t fix blurry edges, for this price point, there are certain trade-offs to be expected. Minor chromatic aberration. When looking at bright light such as treetops, you’ll notice purple fringe. These binoculars don’t have ED glass, so fringing is there. It’s just not overly noticeable that it’ll ruin your view. That’s why these aren’t the best binoculars for birdwatching because you need that ED glass to view birds and see everything. But, since they are top-notch for hunting, you can rest assured that you won’t see any purple deer. Celestron has some of the most popular and best telescopes out there for amateur astronomers. It’s no surprise that Celestron SkyMaster 25x100 gives you double the pleasure of viewing the night sky and our top pick for best stargazing binoculars. The Celestron SkyMaster has a 25x magnification and a 100 mm objective lens diameter. Since the magnification is so high, it’s impossible for you to hold these and enjoy using them because you’ll notice each shake and tremor of your hands. You’ll need a tripod to mount it on, but that’s to be expected when gazing at the night sky. When stargazing, you need every ounce of light that your binoculars can gather. The higher the objective lens diameter, the more light that’s reaching your eyes. The field of view is 156 feet – perfectly normal because of the higher magnification and objective lens diameter. Unlike when birdwatching and hunting, field of view doesn’t matter too much because the stars aren’t moving quickly. The close focus distance is 147.6 feet and eye relief is 15 mm. The Celestron SkyMaster has a Porro prism design that shows better image contrast and is more light efficient. The prisms are coated with BaK-4 which have a higher refractive index than BK7. So, when you hold your binoculars away from your eyes and into the light, you’ll see circular exit pupils. The eyecups are made with a folding design. For optimal performance, you can individually focus each eyepiece to accommodate for differences in your eyes. The body has a protective rubber covering that provides ultra-firm grip. It has an integrated tripod adaptor so you don’t have to worry about them falling while trying to mount them. It’s also water-resistant and can easily adapt to outside temperatures. The Celestron SkyMaster weighs 8.75 lbs. Its dimensions are 18.2 x 11.6 x 6.7 inches. These are heavy and will cause arm fatigue if held for any period of time. Don’t skip out on buying a tripod, even if you believe that 9 lbs aren’t much. The Celestron SkyMaster offers multiple anti-reflective coatings on more than one interior surface. While each air-to-glass surface isn’t coated, an enormous amount of light is still reaching your eyes, instead of it bouncing back from the objective lens. No center focus. These binoculars don’t have a center focus wheel that lets you adjust both the eyepieces at once. However, you’re able to adjust each eyepiece to your desired liking. Needs heavy duty tripod. This is more of an inconvenience. Because of the sheer size of these binoculars, you’ll need a heavy duty tripod to fit snuggly. Unless you own one that’s compatible with these binoculars, you’ll need to go the extra mile and get the tripod it needs. Each binoculars was made to serve its own purpose and provide remarkable quality for its intended use. 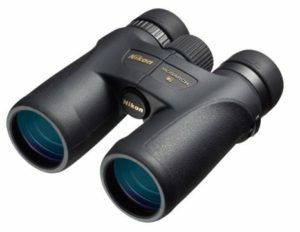 If you’re looking for a pair that can suit you in any setting, then the Nikon 7548 Monarch 7 is perfect. You can even use it for outdoor activities such as hiking. You’ll be glad to have it packed in your hiking backpack so you can view the trees and animals from a vantage point that’s simply breathtaking. If you’re trying to view Mars while it’s close to Earth, then you’ll definitely need to get the Celestron SkyMaster 25x100. Or maybe, you still want to look in the sky, but during the day at birds. If that’s the case then owning a pair of Athlon Optics Midas won’t hurt. And if none of that is your cup of tea and you prefer to only look at animals you’re hunting then the Vortex Optics Diamondback will surely please you. In each scenario, you’re looking at the best binoculars in its class. Just remember that purchasing a pair shouldn’t be a stressful situation. Know what you want, make sure it’s of good quality, and the rest will follow. Q: How much magnification should I buy? It depends. 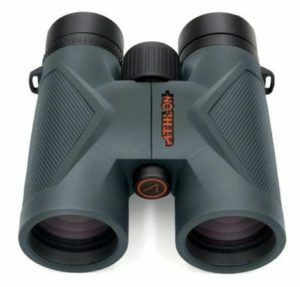 If you plan on using them for birdwatching, then a pair of 7x or 8x will work just fine. Any higher than that and you risk magnifying your hands shaking too much to enjoy the birds. Also, the higher the magnification, the lower the field of view will be. If you’re going hunting with them, then a pair of 8x or 10x can get the job done. But, if you’re trying to go stargazing, then a higher magnification is necessary. Q: Can I use these with my glasses? Absolutely. In fact, each pair of binoculars works great with glasses on. You don’t have to worry about taking them off to see what you’re looking for.